Institute on the Constitution Promotes Indoctrination of Students; Calvin College Has an American Club? Peroutka tells the students that the American view is based on a biblical view of law and government. He then sets up a straw man by contrasting what he considers to be the biblical view with the pagan view of law and government. He says you can call it socialist or communist, but it is the view which is marked by teaching evolution. He says this kind of government will give you health care, retirement and “put an RFID chip in your wrist to, we want to know where you are all the time.” The contrast drawn by Peroutka is apparently designed to scare the kids into buying into his Christian reconstructionist view of government. They look a little bored so maybe very little of the stuff is getting through. About two weeks ago, I wrote about how Liberty University’s Liberty Counsel plans to defend the IOTC’s American clubs in public schools. It seems clear from a review of the IOTC Facebook page that Peroutka and staff are serious about starting these clubs in local schools. While in Michigan, Peroutka apparently stopped in at Calvin College to promote the American Club there. This, to me, is a shocker. I didn’t think there would be a taste among that many students for what Peroutka is selling. 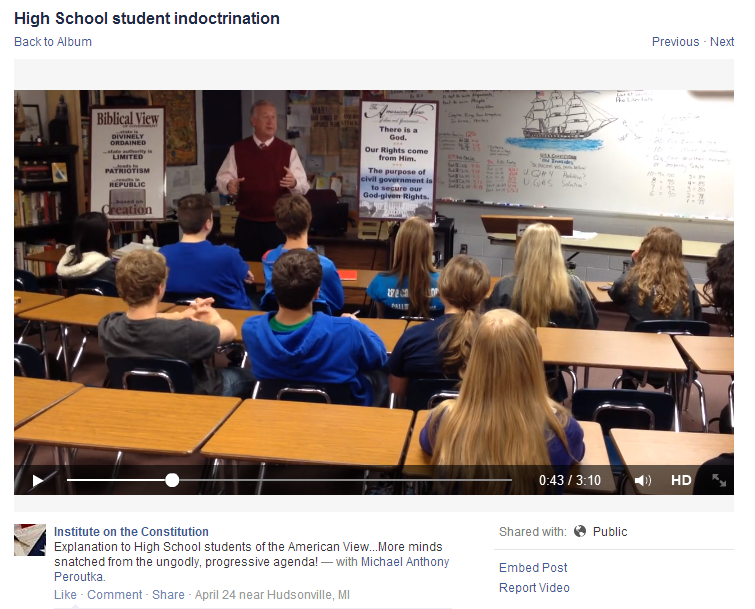 Author Warren ThrockmortonPosted on April 30, 2014 Categories Institute on the Constitution, politics, ReligionTags American Club, Calvin College, Hudsonville, Institute on the Constitution, mi, Michael PeroutkaLeave a comment on Institute on the Constitution Promotes Indoctrination of Students; Calvin College Has an American Club? By now, many people know that Los Angeles Clippers soon-be-former owner Donald Sterling was banned from the NBA due to his comments to his girlfriend berating her for hanging out with black people. He isn’t so great when it comes to how he treats women either but I don’t think that had any impact on his sanctions. Congrats to the NBA on the strong and swift action taken toward Donald Sterling. Adam Silver showed great leadership today. Dimemag.com has a collection of NBA tweets. I hope Donald Sterling is prepared for the harsh reality of being a billionaire with no job. On the Sterling is a Democrat thing, apparently Matt Drudge beat that drum but has now removed his tweet to that effect. Although thinking is the core business of scientists, we rarely ponder how it thrives best; this is ironic, as there is abundant scientific insight to draw upon. For example, it is now known that thinking has two complementary modes: roughly, association versus reasoning (1). We systematically underestimate the role of the first (1), and the way our institutions, meetings, and teaching are organized heavily reflects this imbalance. By contrast, many of the greatest scientists systematically nurtured a balanced dual-thinking process. We should follow their example and reform scientific practice and education to catalyze the unusual combinations of knowledge that often turn out to have the highest impact. Recent experimental work confirms that our capacity to make novel associations is boosted by rapid eye-movement sleep (3) and by undemanding activities that allow the mind to wander (4). This finding suggests that it may be good in a daily routine to alternate our cognitive work with naps or activities conducive to mind wandering. I’m in. In fact, I’ve been in for a long time. The idea that taking walks, reading things unrelated to your research, and hanging out with strangers in a campus pub should be considered part of the serious process of thinking, but might well meet with skepticism in practice. Should we really set time and space apart for things that distract us from our jobs? Yes we should, because many of the breakthroughs in science were made by people who were distracted. I knew there was virtue in distraction but now I can get busy being more distracted so I can finally get to the breakthroughs. *Marten Scheffer, The forgotten half of scientific thinking. PNAS, April 29, 2014, vol. 111 no. 176119, doi: 10.1073/pnas.1404649111. I honestly have a hard time figuring out Liberty University. After finding themselves in some hot water over Mitt Romney, and then more recently Benny Hinn and Ron Godwin’s past devotion to Unification Church founder Sun Myung Moon, you would think they would take more care about the speakers in their chapel. However, last Friday, LU featured Mormon enthusiast Glenn Beck in their chapel. Right there in front of their motto “Training Champions for Christ Since 1971,” Glenn Beck spoke from his Mormon theological base to young evangelicals. To the Liberty students, Beck refers to the Grand Councils which apparently is a reference to the pre-mortal meeting to decide the plan of salvation and other matters, according Mormon theology. I wonder how many classes the LU profs have to spend undoing what happens in chapel. 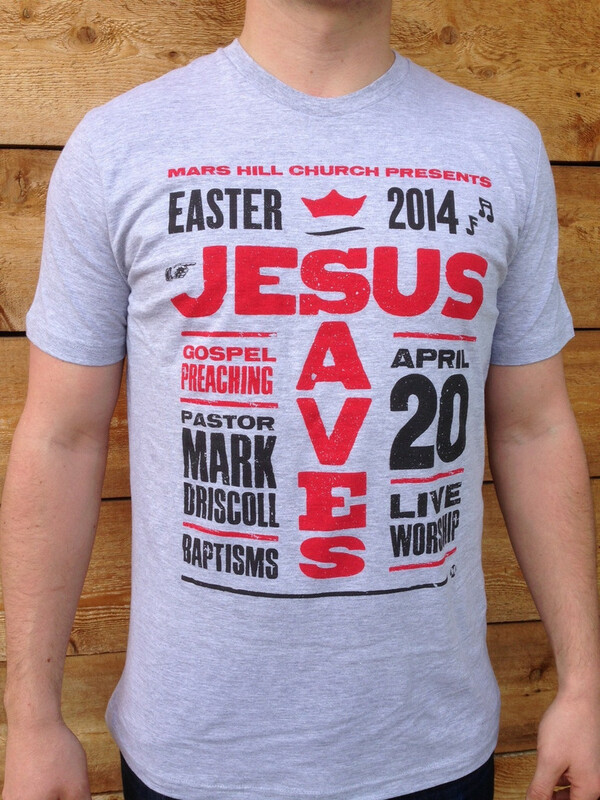 One of our long time friends and pastors, Mike Wilkerson, has decided to step down from eldership at Mars Hill. Mike has been a part of Mars Hill for many years, and we are grateful for his leadership, particularly in helping us build our biblical counseling and Redemption ministries across all 15 churches. We love Mike and wish him well as he will continue to run The Redemption Group Network which exists to help churches develop their own Redemption Groups ministries. In the meantime, Pastor Cliff Ellis from Mars Hill Church West Seattle will be assuming Mike’s responsibilities over Biblical Living ministries. Yesterday we had the pleasure of praying over Mike and for his family at the 7pm service in Ballard. Since he just got back from Latvia and plans to move out of state this coming Saturday, this was the only time we had to do it but are thankful we got the opportunity. Please join me in praying for the Wilkersons as they pursue what God has planned next for them. What seems unusual about this announcement is that the announcement came only a week before he plans to move. Given his level of leadership at Mars Hill (a ministry director – just under the executive elders) and his popularity at the church, it seems abrupt to announce one week and be gone the next. Given the church’s commitment to biblical counseling (nouthetic counseling), I wonder if Wilkerson’s departure will signal a greater involvement by Board of Advisors and Accountability member Paul Tripp, who is also a leader in the biblical counseling movement. In any case, ongoing staff turnover must be of concern to MHC leaders. The 20 ex-pastors have been quiet recently but I understand that some discussions about mediation (although no actual mediation) have taken place. However, the only official answer to my inquiries about the matter is silence. According to this Florida Today report, David Barton is slated to speak at the Space Coast Prayer Breakfast in Melbourne, FL this Thursday. Barton’s most recent book, “The Jefferson Lie, Exposing the Myths You’ve Always Believed,” was withdrawn by publisher Thomas Nelson because of factual errors, but will return. While Getting Jefferson Right: Fact Checking Claims about Our Third President was used by Thomas Nelson as a resource, it is beyond dispute that The Jefferson Lies was widely criticized by academic historians, both Christian and otherwise. The book was voted Least Credible History Book in Print by the readers of the History News Network and garnered many critical reviews from real historians. In prior posts, I debunked Barton’s “two professors” claim. The real story is why Barton continues to be invited to speak about the founding era when he has been so widely discredited as an authority on the subject. Tonight, Barton speaks at Urbana University in Ohio. Grace College history professor Jared Burkholder today published an interview with me on fact checking David Barton’s claims. You can read my answer and the rest of our exchange at the Pietist Schoolman. John Fea brings word that The Ventriloquist, an underground paper at Cedarville University was shut down earlier today. As usual, distributors were set up outside the DMC to pass out copies to students leaving the university’s mandatory chapel service. Before chapel was dismissed, White and Wood walked around the distribution stations confiscating papers. Wood forcefully removed papers from the hands of at least one distributor. When queried, White and Wood stated that The Ventriloquist required prior permission to distribute the issue. Per the student handbook (available online in PDF format here), the only activity that specifically requires prior permission is a “demonstration.” The handbook does not provide a definition of “demonstration,” but The Ventriloquist has distributed twelve issues in similar fashion over the course of the last four years with no warning or retribution from university staff. As an alum, I am sad to hear about this and about the drift to the far right which seems to be gripping the school. Also, I can relate to the students who write for the paper. When Paul Dixon became president of the college during my time there, he appointed the public relations department to oversee the paper’s content. In essence, this shut down the school paper because the newspaper staff resigned in protest. It can now be revealed that I was co-editor of an underground paper published stealthily to replace the absent newspaper. We printed the paper secretly and distributed it literally in the middle of the night. After awhile, the papers started disappearing from where we left them (mostly in the student mail room) and we had to get creative in ways to spread them around. What goes around comes around I suppose. When I first went to the “Ville” in 1975, men were not allowed to grow beards or mustaches and long hair for men was forbidden, women could not wear pants to class, and movies and dancing were prohibited. I got into some hot water for playing Stairway to Heaven at the new student talent night. Music preferences were monitored. Generally, I pushed the rules as far as I could. As a relatively new Christian, I didn’t get the legalism. In years following graduation, Christian rock and pop artists were featured in chapel and other kinds of moderation followed. Before coming to Grove City in 1994, I had an informal interview at Cedarville. However, I received a pretty good education and I know there are fine people still teaching there. I am disappointed to think that the school could be returning to a stifling rigidity and legalism that marked the early days.